Whirlweeds are a form of Trailsnapper that have been enchanted with elemental wind. When potential prey comes close enough, the Whirlweed quickly spin its yellow petals creating a precise jetstream of air. It then releases a fragrant cloud of poisoned pollen that disorientates its prey. 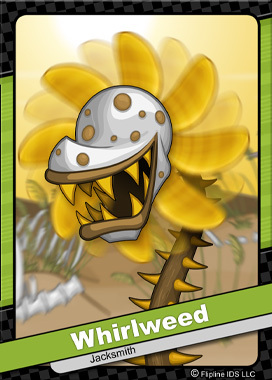 Other Trailsnapper varieties include Tindertulip, Marshtrap, Tundravine, Rockjaw, Electrifern, Snapdragon, and Pitchroot. All of these Trailsnappers are under the complete control of the great wizard, Dudley. ← Papa Louie Pals: Flipdecks Coming Soon!